Use your senses better to steer a boat faster. Improve teamwork between the helmsman and the sail trimmers by using target boatspeed. Employ the target boatspeed concept downwind to select the best sailing angle. Judge the right moment to shoot the finish line. Select the fastest course to sail upwind and downwind in an oscillating breeze (The Wally). 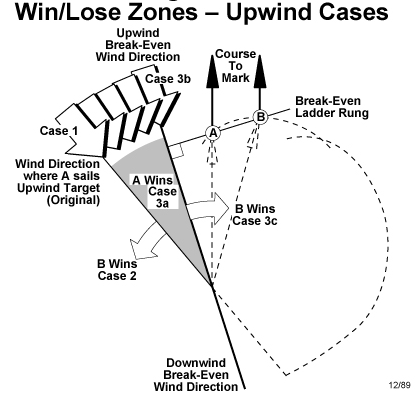 Minimize your losses when you have to sail on the headed tack upwind. Recognize the signs of wind sheer and gradient and adjust your sailing technique accordingly. Apply your new knowledge of wind shear to predict wind shifts with 90% accuracy. Choose the best course to win a long distance race by using VMC sailing. True wind speed, angle and direction and why they’re so important. What Vmg is and why you shouldn’t steer by it. What target speed is and how it produces optimal windward and leeward performance. The Wally, which is a way to squeeze performance out of wind shifts when you can’t tack. The idea of wind shear and gradient, and how it can predict the future. Vmc sailing, a way to get to the mark faster when there’s a long way to go. Order the complete manual for $28 plus shipping. Fill out the order form and Email us or Fax to (203)878-0572. Or phone (203)877-7453. Or visit our web store and order it online. Or get the eBook version from the Google bookstore. How races are lost, not won. Race day strategies based on weather patterns. How to improve your tacks. When to and when not to tack and why. If you are interested in scheduling a seminar in your area, please contact us.